This is a very special post that I'm sharing with you today! 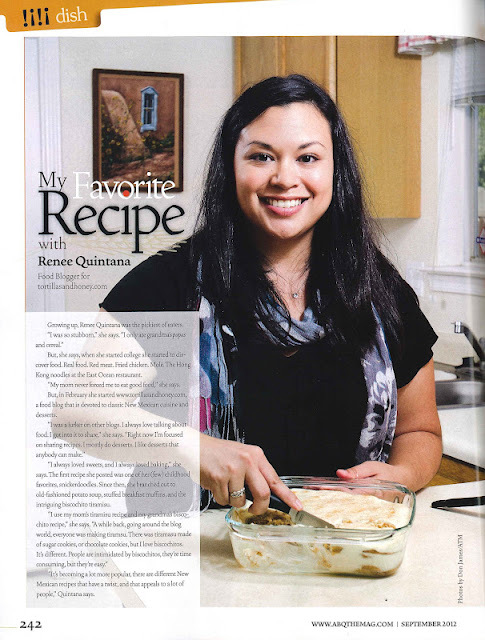 I was extremely fortunate to have been contacted by the editor-in-chief of Albuquerque the Magazine last month to be featured for the "My Favorite Recipe" section in their September 2012 issue! 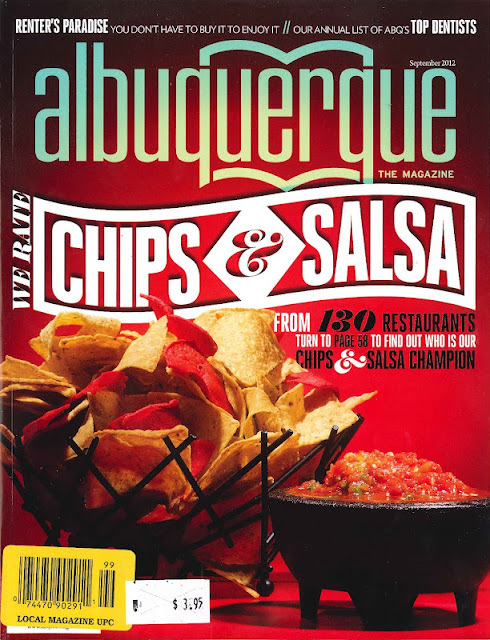 He originally loved the idea of the New Mexico Pile-Up that I posted a couple months ago, but I was afraid readers wouldn't think of it as being very creative, so he asked if I had another recipe that I thought would fit. I suggested my biscochito tiramisu recipe and he loved the idea! The magazine came out the first week in September and I've been so excited and honored to be a part of the magazine this month. Everyone that I've had contact with who are part of the magazine have been so nice and helpful, it's been a great experience. Several years ago, I basically combined both my grandma's biscochito recipe (which is a traditional New Mexican cookie and actually the official state cookie of New Mexico!) and my mom's tiramisu recipe for this beautiful and scrumptious delight. I've made it several times throughout the years and have even made it for my family's "Iron Chef" challenge that we used to do every Christmas. I typically make it around the holidays when I do my Christmas baking, but I've also made it for special occasions including a Super Bowl party. This is one of the desserts that I'm most proud of, and I love sharing it with others. New Mexicans, who have a big fondness for biscochitos, are always very excited when I share this dish with them. It's a nice twist on a decadent dessert, New Mexican style! This is a very rich dessert. For one 9x9 baking dish or medium sized serving dish, this has two containers of mascarpone cheese and between 2 to 3 dozen cookies! Once prepared, this dish has a little bit of heft to it! You can also double the recipe to fit in a larger serving dish or a 10x13 baking dish. I've also made them into individual servings in little mini trifle glasses or other individual serving dishes. 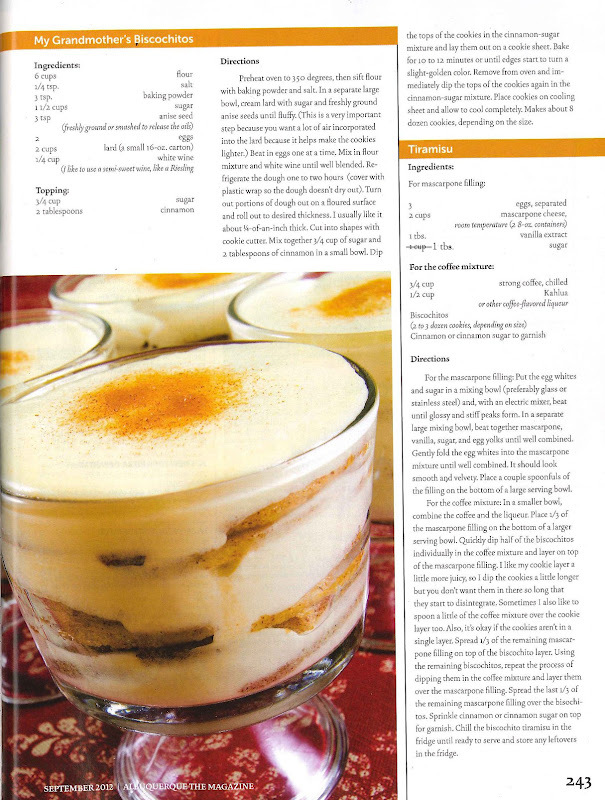 You can see by the photos that I'm sharing with you, there's photos of the 9x9 dish and individual trifle glasses in the magazine. There are also photos of other individual servings and a 10x13 baking dish that I've prepared. You can definitely adapt this to how you want to serve this to your family or friends, it's very forgiving. Mascarpone filling for the tiramisu complete! This served nearly 30 people, a very rich dessert! mixer, beat until glossy and stiff peaks form. 4. Place a couple spoonfuls of the filling on the bottom of a large serving bowl. 1. In another smaller bowl, combine the coffee and the liqueur. 1. Place 1/3 of the mascarpone filling on the bottom of a large serving bowl. 3. Spread another 1/3 of the mascarpone filling on top of the biscochito layer. layer them over the mascarpone filling. 5. Spread the last 1/3 of the remaining mascarpone filling over the bisochitos. 6. Sprinkle cinnamon or cinnamon sugar on top for garnish. 7. Chill the biscochito tiramisu in the fridge until ready to serve and store any leftovers in the fridge. Thank you so much, Kayle! How Exciting ... this is fantastic ... Major Congrats!!! Look at you!! That is sooo exciting!!! Yay! Thanks so much, Raven! 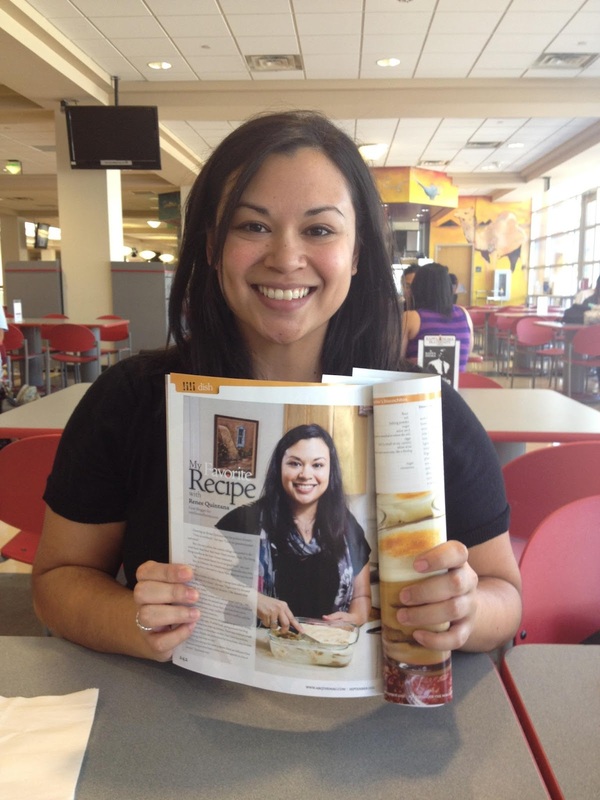 I'm so honored to be in this magazine! And what a delicious magazine! Renee - this is wonderful!!!! What a huge honor and I can tell how thrilled you are! The article AND the dessert looks great! I could easily eat half of this dessert in one sitting. Thanks so much, MJ! I am SO thrilled, never imagined I'd get to be a part of something like this! Hope you're well! What an honor and so totally cool! Congratulations! This is HUGE!!!!!!!!!!!!!!!!!!!!!!!! CONGRATS! Did I tell you that I worked for Senator Bingaman in DC? I have MAD LOVE for NM! (and for biscochitos!). Hugs! Thanks so much, Tiffany! I remember you said you worked for a NM senator, but I didn't know if it was Bingaman or Udall. :-) Hugs back!